Seek honor and glory in the battlefields of WWII in the new MMO strategy game War 2 Victory.Take charge of either Allied or Axis forces and build a lone outpost into a mighty war machine. Build, Expand, and CONQUER! -Expert battle system. Rapid turn-based combat puts you in charge, allowing intricate control of over 30 historically accurate units. Crush your enemies with massed infantry, a blitzkrieg of tanks, swooping bombers, mighty battleships, or stand unconquerable behind an invincible line of fortifications.! -Detailed Resource Management. Control multiple cities, each producing a variety of resources, and manage a growing workforce. Build up your industry, feed your army, and turn your citizens into soldiers or factory workers.! -Develop new technologies to unlock powerful new units, strengthen old ones, or boost your industry.! -Play with millions of people across the globe from your iPhone. 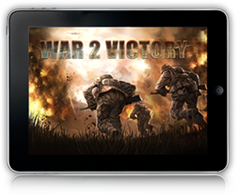 Form powerful alliances with fellow players to crush your opponents and wage epic wars against other alliances. Snowflakes bring good blessing of new year are dancing in the air! Various gifts , purity angels and harvest fruit decorate with X-mas Tree. Jungle’s ring, the new year is coming! For details about these event, please click the red activity Center to get it. All content of this event has nothing to do with Apple Company. Why I was stolen amounts of resources away though I have high leveled warehouses? How to redeem the colonized city back? Why the wall defensive forces do not fight in the battle and the wall bonus does not work? Why ppl can attack me without war declaration? How to modify the commander name? How to change title of the members as an alliance leader?